At Holiday Resort, we have 15 very clean and well-equipped cabins. Each cabin has air conditioning, satellite TV, grill, wireless internet access routed from the lodge, and soft water. We furnish everything for your cabin needs including bed linens, pillows, blankets, dishes, tableware, cookware, toaster, microwave, coffee maker and toilet tissue. The only items you need to bring are your own towels and toiletries. Our lakeside cabins range from 20 feet to 80 feet from the lake. Cabin 10 is 140 feet from the lake with a large private front yard. 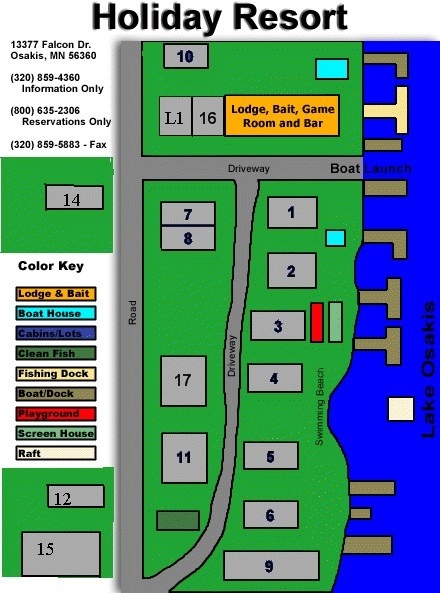 Cabins 7, 8 and 11 are across our private driveway, 135 feet from the lake. Click On Cabin # for rates, pictures and more info!! By request, a 16-foot Lund boat will be available with your cabin. Each additional guest is $100 per week or $25 per night. Day visitors are $5 per person per day. Please come to the lodge for registration. We reserve the right to limit. Pets are $20 per day or $100 per week on leashes only. Deposit Policy: Deposit of $350.00 per cabin is required. Deposits must be paid by check , money order, or credit card. called or mailed to the resort after your reservation has been made. Bookings will be held for one week while awaiting your deposit. After the one week waiting period .If deposit has not been received it will be opened for rental. Our business policy is intended to be fair to our guests, and yet, to prevent loss of income to our business. When we confirm a cabin for you, we refuse all other requests for it. In turn, guests are responsible for payment of the entire reservation fee. Payment of cabin rent is due at the time of check-in. Deposit refund on short cancellation notice is subject to rebooking the reservation. Should you find it necessary to cancel your reservation, please notify us immediately. A refund will be given less 15% of the deposit with a minimum of $15.00 handling if we rebook the cabin. Sales and resort tax not included in rates. Check-in at 3:00 pm. Check-out at 9:00 am.